Decided it was warm enough to start doing my hard runs in the morning. Maybe not too cold, but quite windy this morning in the Provo Canyon. Started with 17 tempo pace 100 meter strides, which eventually took me to the mouth of the canyon. The wind was blowing out of the canyon, as it usually does in the early morning. I wanted to do my "reboot" tempo. However, my plans soon changed as I hit ferocious headwind. First quarter was ok - 1:27, although I did have to work a lot harder than normal. 1:30, then 1:29. Ok, forget the reboots. The pace is too slow, the form is different, the run is totally different. Just try to hit the first 2.5 in 15:00 (6:00 average), and then see what I can do on the way back coming down. Next quarter - 1:34. Ok, we are playing a different type of game, even more different than I thought. Can it get any worse. Yes - next quarter 1:38. It sure can't be any worse than that. Yes, it can - 1:44 on the next quarter. Then the wind eased off a bit, and I was able to speed up to 1:35. However, right before the turnaround the wind was so fierce that it took me 28 seconds to run the last 100 meters. Half-way in 15:59. Turn around, and try to shift gears. This going to be hard. 5:16 mile. Not bad at all. Another half in 2:39. Tried to shift gears on the last mile to break 29:00. Did not quite make it, but still closed in 5:07 with the last quarter in 73 for the total of 29:01. A little bit of jogging, then a mix of 100 meter tempo pace strides alternating with a special running drill - the knee goes up on one leg while the other pushes off trying to cover the maximum distance. This took me back almost to Canyon Glen Park. Turned around, did a couple of strides, then decided to join them in one tempo mile. Ran the mile downhill with a tailwind in 5:06. 11 miles for the workout. During the day did a run with Benjamin and Jennifer, and fit some always on the run miles in between numerous errands and trips to hit 15 mile total for the day. Started the morning with a 1 mile jog. Then went to the temple. In the temple talked with a fellow temple worker. He is 61 years old. Turned out that back in his young years he was a very good sprinter - 21.0 200. I told him that my best 100 m was 13.9. His response was probably similar to what I would have said if somebody had told me his marathon PR was 3:45 - this can be fixed. His suggestion was to use ankle weights to teach the hamstrings to contract when they ought to. My body says this is worth a try. In the afternoon drove to the Provo Canyon to do my speed workout. A warm-up to the Canyon Glen Park. 4 100 meter strides. Feeling good, just not speedy. Hamstrings are refusing to engage at first - maybe tired from my form drills in the last two days. Started my 10x500 with 200 recovery jog. Headwind. 500 is not as weird of an interval as it sounds. Two of them make 1000. 10 make a 5 K. Hitting 1:29s. On a couple, the headwind got strong enough to slow me down to 1:30. Then it weakened, and my nervous system seemed to have gotten a bit snappier. Started seeing 1:28s. Last one in 1:27 without a strong kick to get the 14:48.5 for the 5 K. I wish I could run it like that without having to take 9 200 meter jogging breaks. But as I like to say, do not just wish you could do something or be something - do what it takes to get there instead. Jogged half a mile, and started feeling very good. My jacket was 1.5 miles up the canyon over by the Canyon Glen Park. It is uphill, but there was a good tailwind. As they say in Russian, it would have been a sin to miss the opportunity for a marathon pace tempo run. 1.5 miles in 8:41. Was only trying to do 6:00-6:05 pace but ended up with 5:48. This could be a bad sign - strong headwind on the way back. Got the jacked, and continued the tempo run on the way back. My suspicions about the headwind were correct, although it was not as bad as I thought it could have become. 2:51 for the first 0.5 going down. Then something happened. I started thinking about snappy hamstrings, and it seemed like they started snapping better. The wind either weakened, or I was dealing with it better with the snappy hamstrings. The same effort gave me a 1:24 quarter, then three 1:22s in a row. Then I saw that if I ran a 1:20 it would give me 5:40 average for the 3 tempo miles. I ended up with 1:18 to hit 8:17 for the downhill section of the tempo. Later in the day ran with Benjamin and Jennifer, and added another always on the run mile to make the total 13 miles for the day. Mini-taper for the Moab Marathon tomorrow. Easy run with George and Eric in the morning. Did one tempo mile in 5:43. Ran with Benjamin and Jenny in the afternoon. Ran the Moab Marathon for a marathon pace tempo run as the opportunity presented itself. 2:35:20, first place. Felt very strong. Race results are available here. This race was a rather interesting experience. Six years ago I volunteered to help my friend Curt, who directs a number of local races, to help with his website. This eventually led to me becoming in charge of timing his races. Timing a race means you need to be at the start when it starts, and at the finish when the first person crosses the line. I also need to get a hard run in that day. The logical solution to that problem is, of course, to run the race. I have a back-up person who knows enough to push the button for me, and in case I get beat, for the winner, but otherwise I am in charge. So I have two conflicting goals - to win the race with enough margin to take care of potential problems with the computer, and to arrive at the finish line with the blood sugar level sufficient to operate the timing equipment for a couple of hours. Fortunately for this occasion, Curt does not go out of his way to recruit a strong field, which allows the timing to go smoothly. As you can see from the Course Map and Elevation Profile, the race starts at the Dead Horse Park, follows Hwy 313 to the junction with Hwy 191, then two miles south towards Moab along 191, under the bridge, and back to the Archview campground. First 8 miles a gradual climb on rolling hills at 6000 feet, then downhill to about mile 19 with some rolling hills in the middle, then pretty much flat and rolling to the end. Last 2 miles on dirt. This run was going to answer an important question for me. Do I need long runs to do well in a marathon, or are my 16 milers with a 10-13 mile tempo in the middle sufficient? Since the St. George marathon in October I never went longer than 16 miles in one run. Curt sounded the horn, and we took off. Tried to recruit some company in the first minute, but everybody said they were shooting for 3 hours. So I went alone. Steady 6:00 pace through the first 8 miles. Not bad at all - at 6000 ft with rolling hills going up I was expecting about 6:10. Ate a banana at 6 miles. Then a turn, and we got some tailwind in addition to the downhill bonus. Maintained 5:30-5:40 pace up until 16 miles. Got a low fuel signal at 12 miles, and drank some Powerade. Less than ideal, but better than nothing. Drank some more at 15, if I remember right. Then some headwind came. I got a side ache on the right. This could be just an irritation from the headwind, or could indicate that the liver is running out of fuel. Slowed down to 6:00-6:10 pace, and costed to 20. Half in 1:16:34. 20 miles in 1:56:32. Refueled with Powerade at 20. Tried to be thorough and drink the whole cup. Refueled again at 22. The side ache is gone, and I am feeling very energetic. But now we have some serious headwind and we are going slightly uphill. Was very happy with a 6:30 and 6:44 miles. I was expecting 7:00. Then under the bridge, and two more miles on dirt. But it is slighly down, and with a solid tailwind. Feeling exceptionally good. Too bad it is dirt road, and there are no quarter marks to pace myself. I wish I were in the Provo Canyon. Now if only I could stay on the course. There are so many trails going in all directions. I still see the cones - that is good. With about a quarter to go I saw a mark, but somehow I ended up taking a wrong turn and when I got to the finish, a barbed wire was separating me from the chute. This sure makes for a good story for an April Fool's day - crawling under a barbed wire at the end of a marathon. Could not have thought of a better joke if I were trying to make one up. The marathon did not end there for me. Fortunately I had enough time to get changed, and even tried to find a radio station that had the LDS General Conference. No luck - will have to catch a rebroadcast of the first session later. Another almost three hours of timing the race. The marathon is still not over, though. I've got General Conference and a drive back to Provo coming up ahead. I think I am going to tell Curt I will not time a race on a General Conference day again. However, I am very happy with what I learned today. 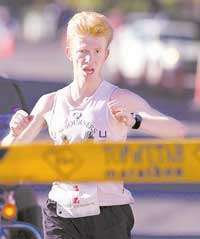 Adjusting for the conditions of the course, I had probably just run an equivalent of 2:27 in St. George. What is more important is that I felt strong on the last 4 miles, probably strongest than ever in a marathon. So I have strong reasons to call this race a success. As I suspected, going long is not what does the job for me to prepare the marathon - it is going medium long, but fast. I also learned something about refueling. Powerade has simple sugars. They give me a funny feeling during the first 10 minutes after the intake, but then the body cleans up the mess and I feel strong. My intuition tells me that a more complex sugar would work better. Maybe I should try Ultima.